Approximately 200 members from Seoul area participated in the meeting, which started at 6:00 am. 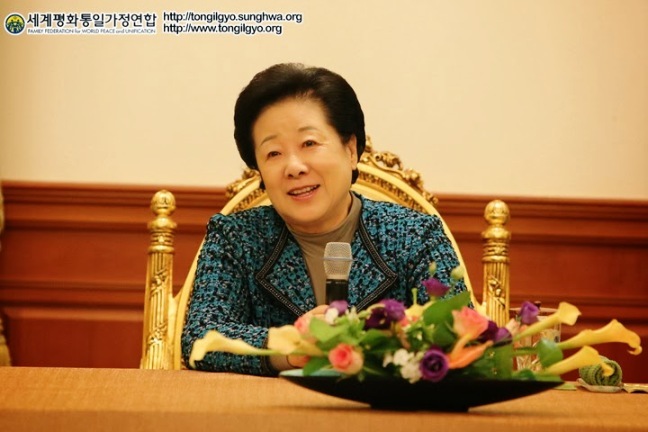 True Mother came in the room; Mrs. McDevitt read Cheon Seong Gyeong; True Mother told Rev. 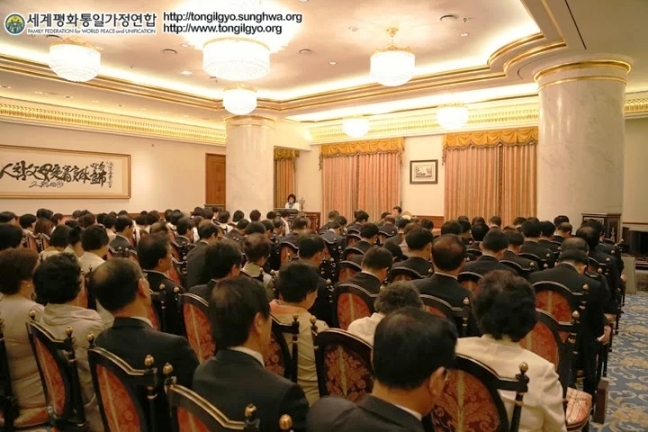 Yook Hyeon Joo, who is the Gang Nam regional leader, to share his testimony on their witnessing activities. In his testimony, Yook Hyeon Joo said "We became united in heart, senior members lead the activities, and all were aligned with Vision 2020. Since we ran a well-organized witnessing project holding two services, one bigger, one smaller, I think we could become a model region in activities." After this testimony, True Mother gave encouraging words to the participants: "Puritans crossed the ocean to go to the new continent looking for religious freedom. The first thing they did after they stepped on the new land was to build the church where they could attend Heaven, and the school where they could educate later generations. After that, they built their own houses." Then True Mother asked them to leave the seeds for the sake of later generations, as the Puritans did. She also said "The US, being united with True Parents after having listened to the truth was supposed to be in the role of mediator. But the US became sick, and so from 1975, True Parents educated, at East Garden, young people from all over the world. At that time, Father gave those young members, who would lead the US, the title 'Top Gun.' In those days, those members were an elite contingent and now they are over 60, 70, even 80 years old. But it is regrettable that the foundation of the 2nd gen who will succeed them is weak. When we think of the Vision 2020, it is time for us to speed up in the providence. That's why I am now training 2nd gen Top Guns." She asked both 1st and 2nd gens to inherit the vision and tradition that True Father gave and to become Top Guns who can realize the Vision 2020. She also said, "Our daily life should be something we can be proud of in front of Heaven. Your Hoon Dok Hae on a daily basis needs to be followed by a life of 'sharing.' There shouldn't be any neighbors around you who don't know True Parents. You, yourself, must be determined with your family to realize God's will in your generation and start every day with such commitment."